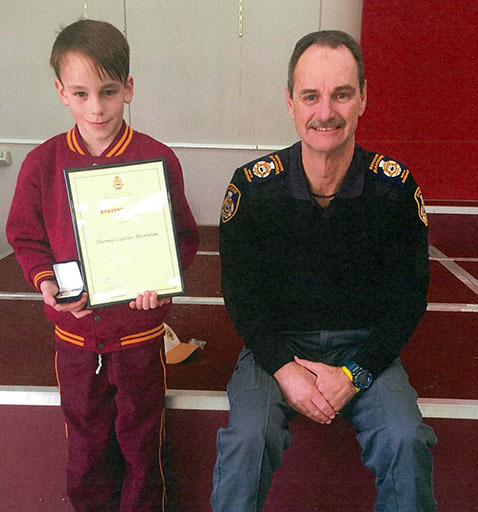 The WA Rangers Association will from time to time present a “Bravery Award” to children who have experienced the extreme trauma of a dog attack. The child will also be made an official “Junior Ranger” of this Association. The purpose of this program, is to help kids who have been attacked and injured by dogs, to get through the trauma and to assist in promoting a quick and full recovery. We hope very few of these awards are presented! Please see the following forms for further information on Junior Ranger Awards and Nominations. 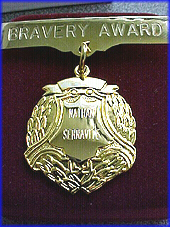 The Award consists of a “Bravery Medal”, a framed “Certificate of Bravery”, each child is given the WA Ranger cap and badge. 7 year old Nathan was attacked by a Melemute/Pitbull cross in 2001 and bravely worked toward a good recovery. 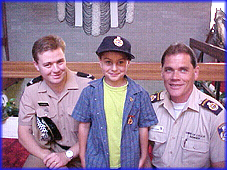 Nathan is seen here with Police Officer Julian Martin and Collie Shire Ranger Ron Frame. 5 year old Jesse was attacked by a rottweiler cross in 2001. He received injuries to his face, scalp and lost a tooth. 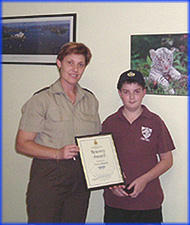 Jesse is seen here with Kalamunda Shire Ranger Mark Casotti. 8 year old Rebecca was attacked by a pitbull in 2001. She received horrific injuries which required extensive surgery. 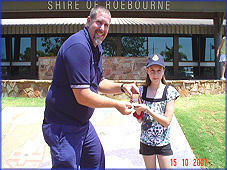 Rebecca receives her bravery award and junior ranger cap and badge from Port Hedland Senior Ranger Lee Valance. Rebecca in hospital at the time of the attack. This picture published with the consent of the victims’ parents. 3 year old Suhalla, was attacked by a neighbours dog, a border collie cross blue heeler in January 2002. She received very bad facial injuries which traumatised Suhalla and her parents. 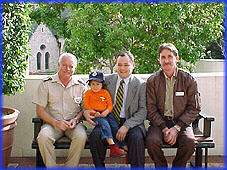 She is seen here after the presentation of her “Bravery Award” with WARA 2002 President Steve Elvidge, City of Fremantle Mayor Peter Taglaferri and the investigating officer of the attack, City of Fremantle Ranger Mark Liddington. 5 year old Breana, was attacked in June 2003 while playing with her 6 year old neighbour and their rottweiler, a dog she had been around many times. She received 8 stitches from her top lip to her nose and also other facial injuries which kept her in hospital care for 3 nights. 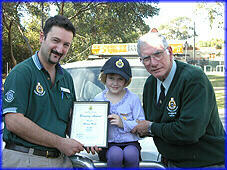 Breana receives her “Bravery Award” from Ranger Corey Easson (left) the investigating officer and Ray Sousa Manager Ranger & Fire Services Town of Kwinana (right). Ray is also WARA Vice President during 2003. In 2005, 11 year old Aaron was attacked by a dog close to his home in Lesmurdie while riding his bike to school one morning. After two medical treatments on the day, Aaron was hospitalised for a week and became considerably traumatised. While out of action with his injury, the sport-loving lad had been unable to participate in his basketball, tennis and swimming activities or enjoy wrestling with his brothers Harry and Brayden. He is pictured here with WARA Vice President Samantha Tarling, receiving his bravery award. He is now much better. 2005, Brooke from Merredin was cleaning out her guinea pig’s cage when a plastic bag blew over the fence. 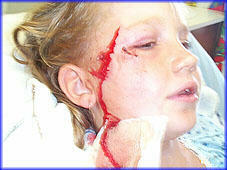 When Brooke looked over the fence, her neighbours mixed breed dog bit her face, tearing away part of her nose. 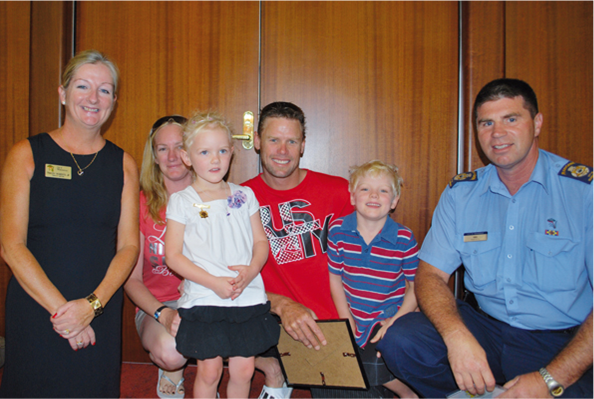 Brooke was going for her third operation the day she was presented with her award. She is seen left with WARA Treasurer Dave White. 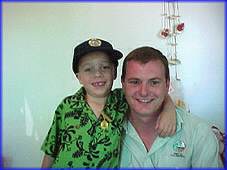 October 2005, Zeke and his brother joined other children to play in a park in Paraburdoo in North Western Australia. Zeke tried to pat a local Rottweiller named “Woody” when the dog attacked and bit the right side of Zeke’s mouth. He was taken to the local hospital and later air lifted to Perth for specialist surgery receiving 103 stitches to his top lip. The dog was destroyed. Recovering, Zeke is pictured with Ashburton Senior Ranger Morgwn Jones. Bailey is a little boy from the Bunbury area who was bitten by a dog in December 2006. He received injuries but after micro surgery, he has recovered and still plays with dogs with no bad effects. Bailey is pictured with his mum & dad and Rangers Jacqi Robinson & Murray Halden at his Bravery Award presentation. In September 2007, Jamaica from Karratha was at a sleep over with her friend when a maltese X bit her on the hand and face. The injury to here face caused her to be flown by flying doctor to PMH where she received 15 external stitches to her mouth and a number of internal stitches. 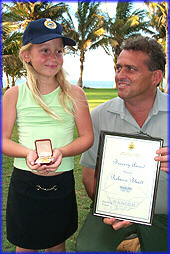 Jamaica is pictured here with Ashley Robbins from the Shire of Roebourne Rangers receiving her Junior Ranger Bravery Award. 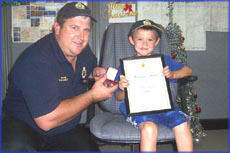 This is 3 year old Taidon Milton, he received a bravery award after he was attacked by a neighbours rottweiler. Taidon is pictured with Clinton Venables Town of Kwinana (investigating officer) & WARA members Colin Curry & Peter Oliver after the presentation checking out the Rangers vehicle. Child attended next door with older children to borrow something from the property. The person there answered the door and went to get what they wanted. The Male Rottweiler dog rushed past them, through the door and aggressively attacked the victim. Everyone jumped on the Rottweiler and eventually broke up the attack. The Child ended up with massive injuries. Plastic surgery with muscle reattachment to right arm. 15 Stitches in right arm. Puncture marks and injuries to head, ankle, behind ear and grazed forehead. On 05/11/2009, City of Wanneroo Ranger Eric Ayers conducted an investigation into a dog attack complaint on four-year old Abbey Brimson. This unprovoked attack occurred at a retail plant nursery in Jandabup, which resulted in Abbey receiving a deep laceration, puncture wounds and bruising to her right thigh. Treatment for her injuries required ten stiches and plastic surgery. A year prior to this incident, Abbey had unfortunately been subjected to a confrontation with an aggressive dog, which she had just recovered from. 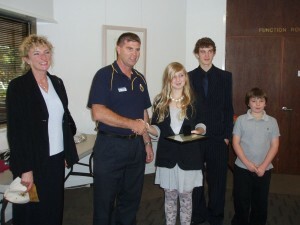 Deputy Mayor Tracey Roberts kindly attended the function and presented Abbey with her bravery award. 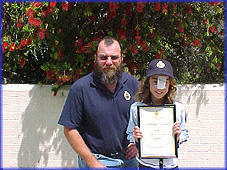 Saskia is pictured here with WARA President Eric Ayers receiving her Junior Ranger Bravery Award. Saskia, then 13, was bitten by one of two dogs owned by her friend’s family while she was visiting for a sleepover at the Roleystone house in December 2009. She was treated at Armadale-Kelmscott Memorial Hospital before being transferred to Princess Margaret Hospital for Children where she received 37 stitches on the outside of her face and more in her mouth. According to her mother Lizzie Jolly, Saskia was very brave throughout the ordeal, “especially when she had the stitches out as it was extremely painful. On the 29th January 2011, Jarmin was savagely attacked by a staffy cross. His face was ripped open requiring extensive surgery, which is still ongoing, his arm was savaged as well and his leg was bitten through to the bone causing infection in the bone. Award presented by City of Albany Senior Ranger Rob Forster and City of Albany Mayor Milton Evans. 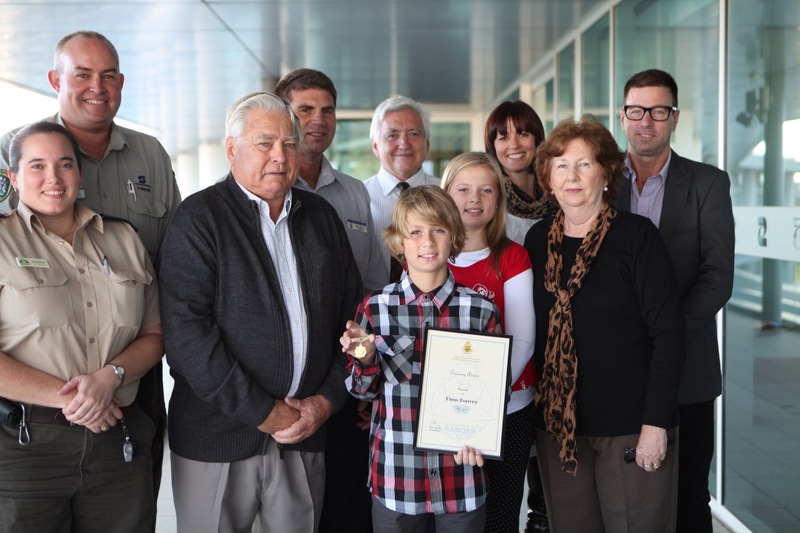 Finn is pictured here with WARA President Eric Ayers, WARA Secretary Sharna Murton, his Family and staff from the City of Stirling receiving his Junior Ranger Bravery Award. Finn Toovey, aged 10, was bitten on the thigh by a Rhodesian Ridgeback X dog whilst riding his scooter through the park in October 2011. Finn’s injuries required plastic surgery as well as three day hospital stay. Finn’s presence of mind and ability to provide crucial information regarding the dog resulted in a successful prosecution of the dog owner. 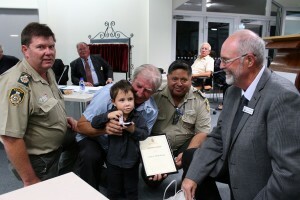 Three-year-old Chase is presented with a bravery award by Deputy Mayor, Cr Neil McIlwaine; right, watched by Darren Cole left, Chase’s grandfather Mal Whitehead and Archie Brown. City of Greater Geraldton Animal Control Team Leader, Darren Cole, and City Ranger, Archie Brown, nominated three-year-old local boy Chase, for a Bravery Award through the WA Ranger Association after the youngster suffered the trauma of a dog attack. Chase and his mum, Kelly, were visiting a Geraldton property when the dog bit him on the face. The injuries he received resulted in an emergency flight to Princess Margaret Hospital in Perth for emergency treatment and surgery. Chase will require ongoing treatment for a number of years as a result of injuries received in the attack. Chase was pretty chuffed with his award, presented to him at the Ordinary Meeting of Council on Tuesday (April 22), by Deputy Mayor, Cr Neil McIlwaine, and proudly showed off his medallion to the public gallery. Chase’s grandfather, Mal Whitehead, praised the City’s Rangers for their ongoing support throughout Chase’s ordeal. “I’d really like to thank all the rangers who helped Chase,” he said. 9 year old Jai was riding his scooter at home on his driveway after school when a neighbours American Bulldog jumped his fence and began to attack Jai biting him on his left arm several times. The attack continued for a lengthy period of time with the dog refusing to release Jai’s arm. Jai’s Father came to his son’s aid and tried repeatedly to remove the dog from Jai. After several minutes the dog released Jai and then began to attack his father. With Jai’s quick thinking, he ran up the street to get some help for his dad. He flagged down passing motorists to come and help his dad. 11 years old Thomas and his family took their pony to a farm property in Dardanup. Thomas was standing near the rear of the float as the pony was being unloaded, when a male Labrador dog made its way to Thomas and sat on his foot. As Thomas patted the dog in a friendly manner and the Labrador jumped up and bit Thomas on the face. Thomas received lacerations to his head. He was taken to Bunbury Regional Hospital, then was transferred to Princess Margaret Hospital for further treatment. These are brave little people who deserve their Award and our continued support. 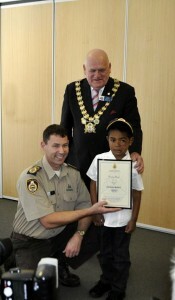 WA Rangers Association, caring for kids!